we hope you are too! My resolution is simple! Because I am a very slow reader, I want to make sure that completing my Book Club's monthly choice does not interfere with other books I really want to read! Turns out I found a Wikipedia site called “Slow Reading.” Like “Slow Food”, there is a reason and rhyme to the movement: “slow reading is the intentional reduction in the speed of reading, carried out to increase comprehension or pleasure.” Ah, that mine was intentional! Now, what’s your reading resolution or goal? 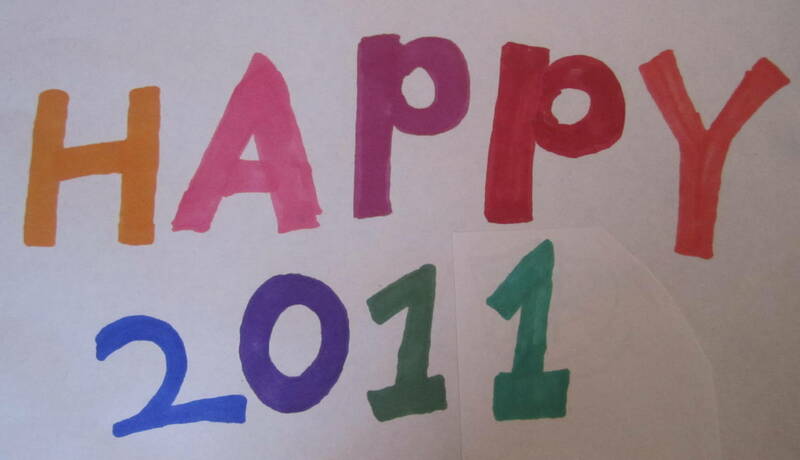 Happy Reading in 2011! My resolution is to not go book-on-tape-less! I listen to books on tape everyday while I work at my desk --while I draw color paint and sometimes even clean my room! I feel lost when I do not have books on tape to listen to. First I MUST thank the Bean --my wonderful Mom, the Sisters Nana-- she offered this challenge and we jumped up and down (really) we were giddy to start off this year with help and with such a great idea! My resolution is turn off the computer and READ more at night. Lately I find myself clicking away after the Sisters go to bed --this used to be my "me" time for reading. I will work to shut off the computer, make a cup of tea, grab my book and escape to wherever my book wants to take me! I can't remember the last time I made ANY New Year's resolutions. But faced with a challenge, I resolve to complete the clearing out of my book shelves so that I'm left with only those books I would not give up, that I would take with me wherever I go from here. No small task, although I've already rid myself of hundreds. Happy New Year to the Four of You and the rest of the BFWP gang! I don't typically make New Years resolutions, however while on was on vacation recently I made a couple of promises to myself: to explore new authors (sometimes I get into an author rut) and to check out books from the library instead of buying them. Since making myself this promise I have been reading several books by Truman Capote I checked out from the LIBRARY, and also cooking up a storm from a French cookbook from the LIBRARY! Yeah! The drawback to the holidays is not getting to do our regular challenges! Hope the books for walls family had a good break, though. Mine is a pretty normal book resolution...become a more adventurous reader. More specifically, to choose books I wouldn’t normally. BUT, I’ve been primed over the last year by everyone’s post to do just that. I think I’m ready to spread my wings/pages and fly/read some of my daring choices. I tried to include the whole family in this one. My husband wants to create more rhymes that could eventually turn into a book. The kids think I’m crazy, why would anyone have goals with books. You just see one, pick it up, and have it read to you 50 times. All of your responses have me thinking. Lynn's especially. And so, I have ANOTHER resolution: TO CLEAN UP the bookshelves. I have dreams of our shelves being organized by author, subject and inspiration... I can dream! But the question is... Where do I begin? my goal is to read more of the books that lillie's reading so that we can talk about it - for really, that is what reading is half about, to share. :) she's on book 9 of 39 clues so i have to hurry!! LOL. also, i concur on the stopping the computer/tv at night, and READ. brilliant! organization? nope. takes away half the fun! ha!